Here I thought the 30 minutes a day outdoors for 30 days would be the challenge. 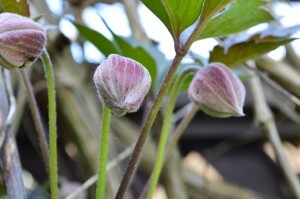 It’s turned out that posting updates is my biggest hurdle! I had an Ashford order come in this week. Things I needed for students and then some things that I felt it was my duty to test drive for students. 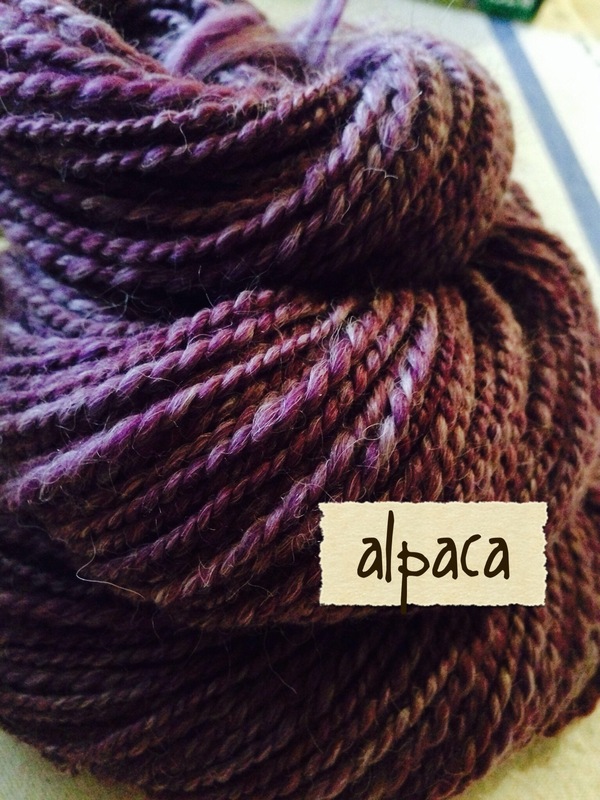 Love, love, love this alpaca merino blend roving. The colour is “slate” and I believe I may be spinning the entire kilo. If anyone is interested in trying out this roving, let me know. It spins like a dream. I had two wheels go out the door this week to two super enthusiastic students. So part of my week went to putting together and waxing wheels. Not something I am highly skilled at doing, but a pleasure none the less. 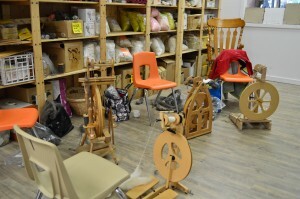 I also taught the second half of the Beginner Spinning Workshop at Birkeland Wool. This group was crazy fun. Not only had they done all their homework (filling lots of bobbins), but they were so advanced that I was able to squeeze in three ply and navajo plying techniques as well. It is classes and moments like this that make me treasure the experience of teaching. Since I am taking two classes right now through the VSB, I am really, really getting into the camera. With that comes a lot of editing software and I found this wonderful little programme that lets me turn the photos into sketches. Not that the actual pictures of the yarn were not interesting, but how can you discover a button and not push it? Okay, now this is not how I wanted this to go…I was hoping to post everyday, however this outside thing has me super busy and engaged. It makes me want to go farther though. And since I’m self employed, I really need to find a way to enjoy nature and keep working. Bonus-the colours outdoors now are inspirational. Monday had me working in the garden and loving it. 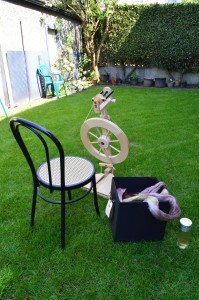 I came back inside as I promised one of my spinning students a chance to borrow the Kiwi that I hadn’t put together yet. So with my limited tool kit I made it. 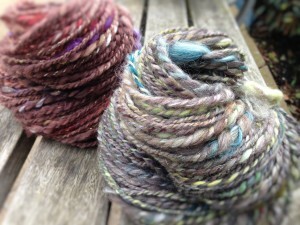 I spun on the Lendrum for breaks so I mananged to finish some beautiful yarns yesterday. I decided to photograph them today in natural light, so I took them for a walk to Quincey’s house. I would usually walk down the main drag, basically following the bus route. 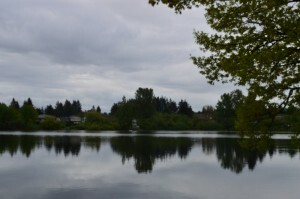 Today, I followed the bike path and found several lovely parketts along the way as well as blooms everywhere. 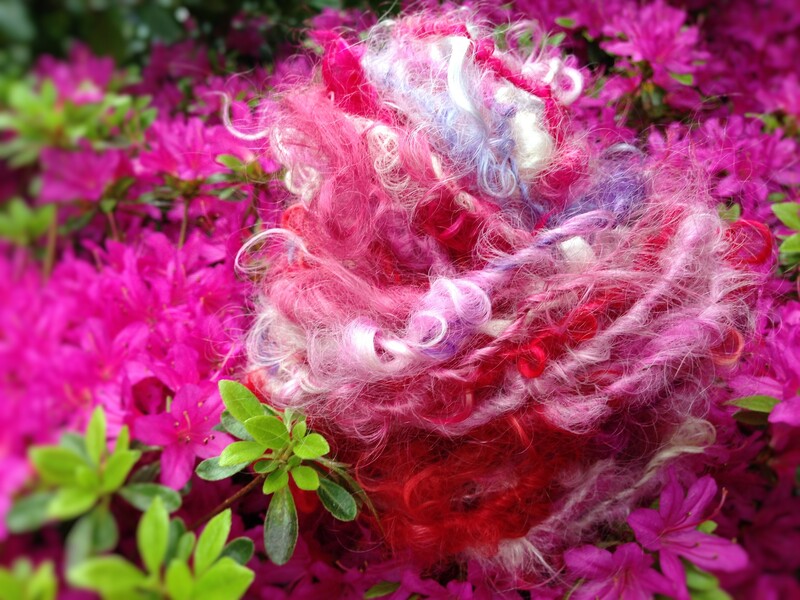 This Beauty yarn is comprised of hand dyed mohair locks. These locks have been languishing in the studio since last March. What was I thinking, ignoring these lovely locks? I’m so happy that this is actually yarn now. Although my option would probably be to wear it, rather than knit or weave it. 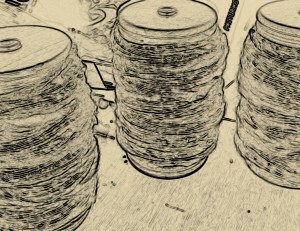 With the remainder of the locks, I decided to do some carding. Wanting the locks just to be highlights and for the yarn to have more practical uses. 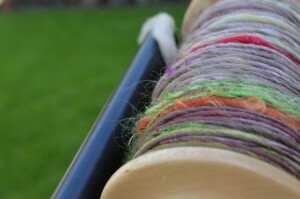 There are so many ways to spin wool and yesterday I was really wanting something different. 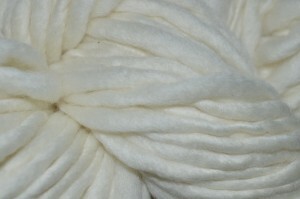 I love texture and I love a two ply, but thread wrapped around and thick and thin yarn is a bit old hat. Answer. I used the same batt to spin both the thick and thin single and the ply yarn…I am very happy with the results and will definitely spin more. The walk today gave me a great backdrop for photos. I think I’ll do more of that too. Just working out my outdoor plan for tomorrow –which may involve dragging my wheel (and a pound of wool) to a park. Rainy and cool. Perfect for today’s nature project before I teach the second half of the Beginner Spinning class this afternoon. I did it! 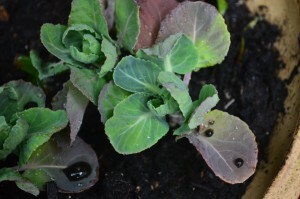 I finally started the garden this year. 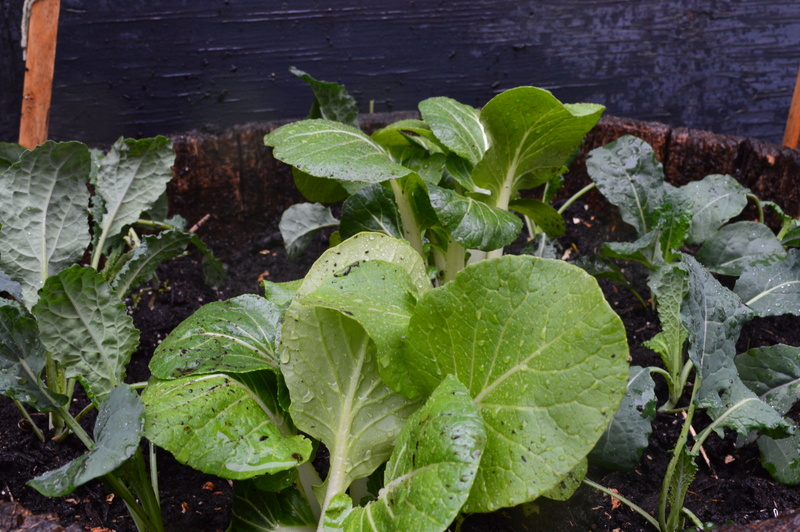 I didn’t get it all done at once, spending a good hour reworking the soil and compost and getting these little beauties in the ground. I’m focusing on greens this year so brussel sprouts, bok choy, spinach and several varieties of kale. Here’s hoping I have it all done by next Sunday. I know these posts aren’t yarn heavy, but they will be. There’s always yarn and this finally dried today. A wonderful single ply merino ready for cozy winter knitting. I enjoy thinking of all seasons at the same time. I like to have a bunch of all white in my stash at any given time. Crisp. While enjoying the lilac and getting deep into the soil, I had a visitor who doesn’t usually hang with me in the yard. Even Asia is getting into the spirit of the 30/30 and was enjoying some little birdies in the tree. Time to get ready for class in the studio. The apricot scones have cooled. I’ve made room for the wheels and now I’ll just sort out the bits of yarny goodness that seem to spread over every surface. I’m looking forward to this group today. I love the enthusiasm of new students. Please check the class schedule as I will be adding the new summer classes this week. There will beat least one spinning class and a free form crochet class. 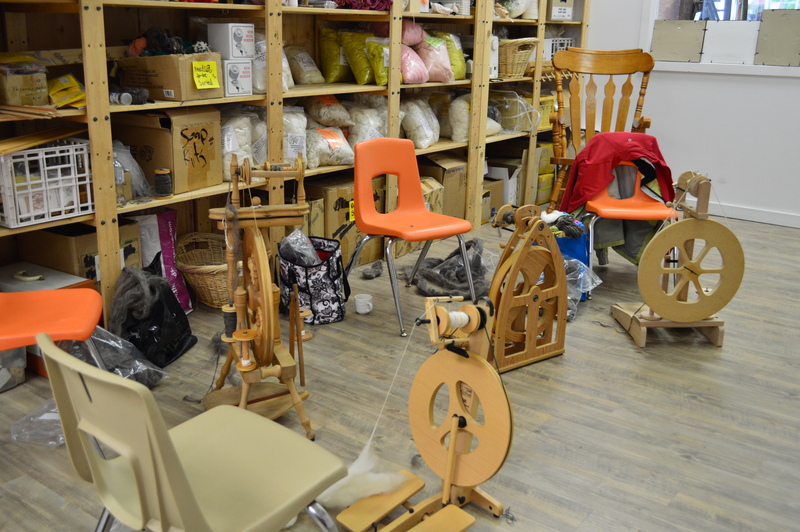 Today was an early trip out to Abbotsford to teach a Beginner Spinning Class at Birkeland Wool. My first foray into outdoors was to photograph yesterdays’ navajo plied yarn….Much success and a huge happy with this yarn. I was all prepared to go straight to the yarn shop when John surprised me with this lovely road less travelled and we parked at the Mill Lake Park. What a stellar early morning hike before 4 hours of teaching. And smack dab in the middle of the city. It was a bit rainy, but nothing worthy of rain gear. There were several families of geese and I was shocked to see the babies almost greenish in colour. Camoflage apparently, and good thing since we were told there were two eagles in a tree close by. One more awesome thing about being out in a park, you meet other interesting humans who also enjoy the outdoors! I’m thrilled to be doing the 30/30 challenge. 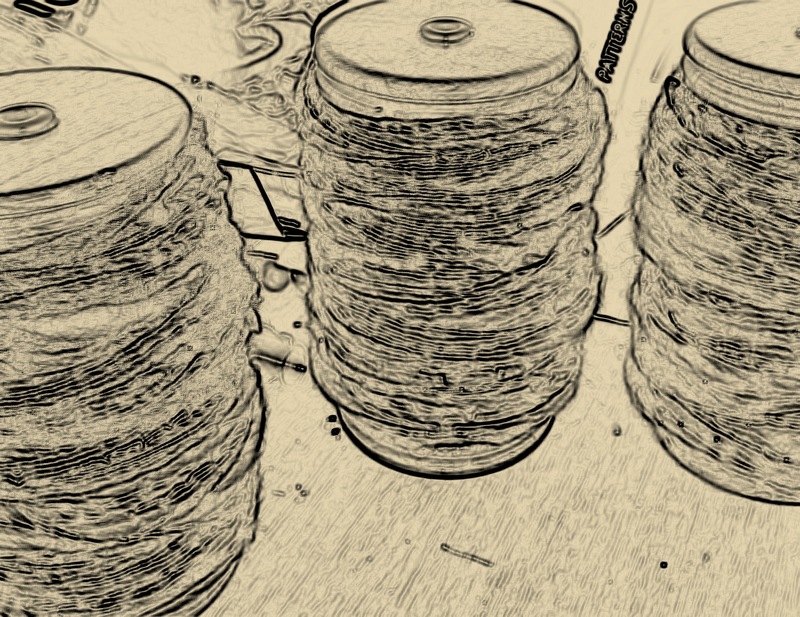 It has given me an opportunity to slink back to the neglected blog. 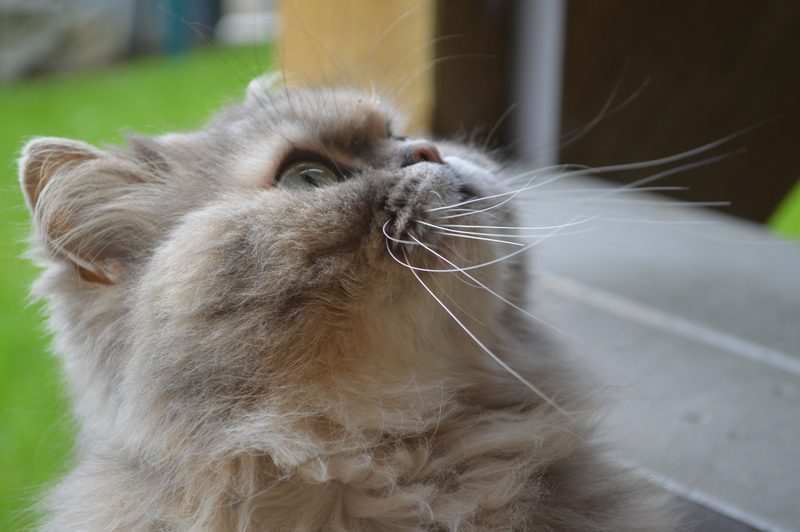 It’s also giving me quality time with the new camera. And an office without walls—stellar. Today was a bit more complicated. But I only needed a half an hour. Where to go and what to do. Let’s try the backyard again. I didn’t feel like dragging the wheel out, but I do need to do some homework for my photography class, so why not outdoors today? Exercises for class were to work on the manual settings and to work with natural light. Making sure that I had enough time in the yard, again finding that half hour didn’t seem to be a problem, I had ample photos to work with. When I came back into the house to spin, it was a definite shift in work. More productive and accompanied by a lovely new herbal berry leaf tea. I did decide to navajo ply yesterdays’ merino and mohair wool. It’s currently soaking in the sink. It’s only about 40 yards, but I think it will make something amazing. Off to Abbottsford tomorrow to teach at Birkeland Wool. Looking forward to my half hour–rain or shine. Day 1/30 Welcome to the new office. 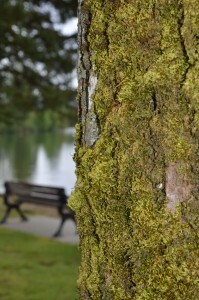 David Suzuki’s May Challenge of thirty minutes outside for 30 days is a challenge I’m willing to take on. Rain or shine, finding the time to be outside in nature changes everything. The first idea for day one was to move the studio outside. But we’ll call this day “near nature” just to the backyard. 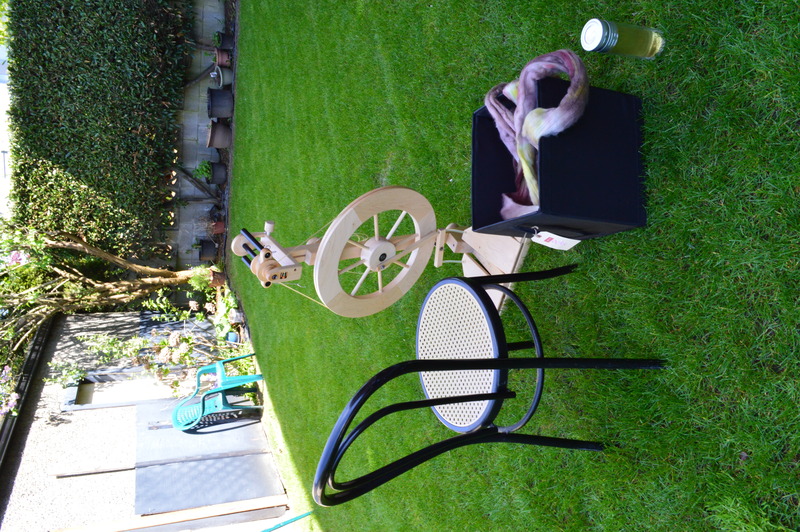 I made some tea, grabbed a chair, a spinning wheel and a box of dyed mohair locks and planted myself in the middle of the yard. The sun was out (not too bright) and it was nice and breezy. Thirty minutes ended up not being the challenge, but rather coming back into the house. The lilac tree was wafting intoxicating aromas through the yard. How amazing is this? How tranquil. It’s hard to believe that I am in the zone, in the yard with no Netflix to guide me. It was an hour and a half before I even realized the time so I packed up and came back inside. I continued to work, but with the perfume of lilac still in my nostrils and the heat of the sun still on my skin. And this is only Day 1, yah! I was thrilled with the yarn, and set the bobbin to the side. I had a student coming for a spinning lesson at 6:00pm. I wondered if she would want to spin outside. Maybe next week. First outdoor work of the year.